Originally published under the title "Minority Communities Can Be Trump Allies — If He Makes the First Move." 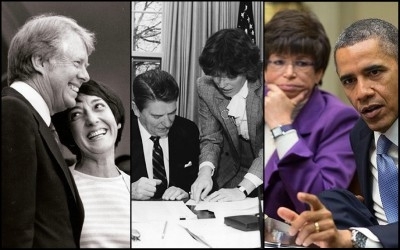 Previous Office of Public Liaison (OPL) heads include (left to right) Midge Costanza, instrumental in broadening the Carter administration's outreach to women; Faith Ryan Whittlesey, who helped Reagan woo the religious right; and Valerie Jarrett, dubbed the "ultimate Obama insider." By nearly any measure, last week was a rough one for the Trump administration. For many communities, the president's posturing in the wake of violent neo-Nazi and white nationalist rallies in Charlottesville was plainly unacceptable. As a former Jewish community professional, I understand why Jewish groups from across the political and religious spectrum spoke so loudly against the president's statements that there were good people on both sides. Extremism is a real problem in this country, and the existence of extremism on the left is no excuse for extremism on the right. The Jewish people have seen what happens when extremists are empowered, and we cannot let it happen again. The president caught a lot of flak for his words last week. But combatting extremism isn't about rhetoric, it's about action, and taking concrete steps to make a difference will allow the White House to turn the page on this ugly chapter. Buried beneath the news of Bannon's departure, the director of the White House Office of Public Liaison, George Sifakis, also announced his resignation on Friday. This is significant because, since the mid-1970s, the Office of the Public Liaison (OPL) has traditionally overseen the White House's efforts to build relationships with special interest groups like trade associations and think tanks and managed engagement with minority groups like African Americans, Jews, Latinos, LGBT Americans and more. The Trump administration has been lax in filling public liaison positions. Unlike his predecessors, Trump hasn't filled any group-specific positions within OPL. That sent a signal to many of these minority groups that the president's comments on Charlottesville seemed to reinforce. The opportunity today is clear: Fill the public liaison positions with people who understand their communities and empower them to help destroy extremism wherever it's found. Having a public liaison wouldn't really mitigate the impact of the demonstration in Charlottesville on Jewish or other minority communities, but it would give leaders in those communities an avenue and an ally for expressing themselves. It's difficult to overstate the importance of these positions; they give people a voice and ensure that even if people oppose the administration's policy, they don't feel disenfranchised. Another avenue calling out for action instead of rhetoric is the Civil Rights Division at the Department of Justice. The administration's proposed budget for next year envisions tremendous cuts to that office, which would result in substantially fewer staff at the Justice Department focused on protecting minority communities. Fully funding that office would go a long way toward demonstrating to the American public that extremists, not minorities, are the enemy. Rabbi Rick Jacobs of the Union for Reform Judaism issued a statement that said, "the vile presence and rhetoric of the neo-Nazis who marched [last] weekend in Charlottesville is a reminder of the ever-present need for people of good will to stand strong, to speak loudly against hate, and act both to delegitimize those who spread such messages and to mitigate the harm done to the commonwealth of our nation and to those that are the targets of hate messages." Trump can make significant strides combatting extremism in places where Obama accepted it. Jacobs is right. We must combat the hatred coming from white supremacists. But we must also remain vigilant to hatred coming from the left, even if it looks like understanding or political correctness. In that vein, this White House could make significant strides in combatting extremism in places where the Obama administration accepted it. The Obama administration ran a working group on "Countering Violent Extremism." This sounded great on paper, but in practice the CVE program was too willing to engage with groups that supported violent radical Islamists. The program ended up providing cover for radical Islam instead of making any progress combatting violence or extremism. On the campaign trail, Trump promised to reshape that working group into a White House Commission on Radical Islam. My colleague, Daniel Pipes, provided substantial guidance on how to get it right. The Trump administration's Commission on Radical Islam should be focused on bringing the American people together around a common understanding of those who wish to do us harm. Dating back centuries, the Jewish people have built special relationships with the occupant of the Oval Office. Trump has a Jewish daughter and son-in-law. He's worked closely with members of our community throughout his career in real estate and entertainment, and he's been a strong supporter of the state of Israel. His rhetoric in the wake of the disgusting displays in Charlottesville gave many in our community pause, but he now has the chance to make everything right and make progress on a major campaign promise. I, for one, hope he takes it.